Joan Miro (1893-1983) was born in Spain but was drawn to the Paris art scene as a young man. Throughout his long career, Joan Miro’s artwork was a bridge between the figurative and the abstract. Miro was prolific in his production of art during his adult life, painting, sculpting, printmaking and later working in stained-glass and ceramics. Starting around the age of 40, the artist began producing spectacular lithographs, pochoirs and etchings, many of which we offer here at deep discounts. 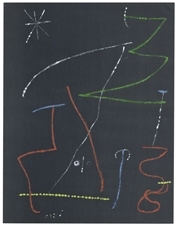 Joan Miro artwork is popular and highly collectible. 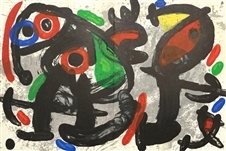 Joan Miro prints, Miro pochoirs and Miro lithographs were produced in great quantities during the 1950s and 1960s and we have dozens of affordable, original works of Joan Miro art for sale. At AffordableArt101 we're known for “Top Selection and Low Prices”! Medium: pochoir (after the oil on paper). Issued in 1967 in an edition of 1200 for the rare exhibition catalogue "Oiseau solaire, oiseau lunaire, etincelles", published by the Pierre Matisse Gallery. This is a fine impression printed in Paris by Ateliers Daniel Jacomet. Sheet size: 12 x 27 1/2 inches (305 x 700 mm). This work was issued as a folded sheet with two center folds. Not signed. Medium: original lithograph. Catalogue reference: Mourlot 441. Executed for Derriere le Miroir (issue No. 164-165 -- L'Oiseau Solaire, L'Oiseau Lunaire, Etincelles) in 1967, and published in Paris the same year by the highly regarded Maeght atelier. Sheet size: 15 x 33 inches; with two center folds, as originally published. Unlike most lithographs issued by DLM, there is no text on the back. Not signed. Condition: there are pinholes and wear from the binding stitches along the left center crease. Medium: original lithograph. Printed in Paris in 1964 by Mourlot Frères and issued in a limited edition of 2000 on Arches wove paper. Image size: 3 1/4 x 7 1/2 inches (80 x 185 mm). There is printed text beneath the image and on back, as published. Not signed. Medium: original lithograph. Executed for Derriere le Miroir (No. 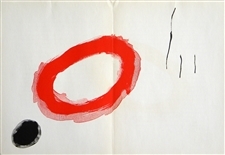 128) in 1961, and published the same year by the highly regarded Maeght atelier. Sheet size: 15 x 22 inches; with a center fold, as originally published. Not signed. Condition: there is some creasing near the edges of the sheet. 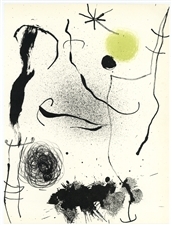 Joan Miro original lithograph "Composition 4"
Medium: original lithograph. Catalogue reference: M 235. Executed in 1956, printed by Mourlot and published in Paris by Maeght especially for the Jacques Prevert catalogue. Sheet size: 9 x 7 5/8 inches (228 x 193 mm). Not signed. Condition: there is minor wear to the top left corner of the sheet. Joan Miro original lithograph "Composition 1"
Medium: original lithograph. Catalogue reference: M 232. Executed in 1956, printed by Mourlot and published in Paris by Maeght especially for the Jacques Prevert catalogue. Sheet size: 9 x 7 3/4 inches (230 x 195 mm). Not signed. Medium: original lithograph. Catalogue reference: Mourlot 508. Executed for Derriere le Miroir in 1967, and published in Paris by Maeght. Sheet size: 15 x 11 inches (380 x 280 mm). There is text on the back, as issued. Not signed. Medium: original lithograph. Catalogue reference: Mourlot 507. Executed for Derriere le Miroir in 1967, and published in Paris by Maeght. Sheet size: 15 x 11 inches (380 x 280 mm). There is text on the back, as issued. Not signed. Joan Miro original lithograph "Woman and Bird in Torment"
Medium: original lithograph. Catalogue reference: Mourlot 510. Executed for Derriere le Miroir in 1967, and published in Paris by the Maeght atelier. The principal portion of the lithograph takes up a 15 x 11 inch space, but part of the lithograph extends over onto the left side of the folded sheet; the entire sheet measures 15 x 22 inches (see the second photo). There is a center fold with text on verso, as originally issued. Not signed. Medium: original lithograph. Printed in Paris by Atelier Arte and published by Maeght in 1974. Sheet size: 11 x 22 inches (275 x 562 mm). There is a center fold, as issued. Signed in the plate, not by hand. 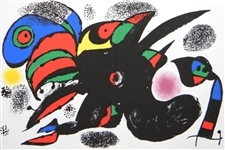 Joan Miro original lithograph "Composition 6"
Medium: original lithograph. Catalogue reference: M 236. Executed in 1956, printed by Mourlot and published in Paris by Maeght especially for the Jacques Prevert catalogue. Sheet size: 9 x 7 3/4 inches (230 x 197 mm). Not signed. Medium: pochoir. Printed by Jacomet for XXe Siecle in 1957 for issue number 8 "Art et humour au XXe Siecle" and published in Paris by San Lazzaro. Sheet size: 12 3/8 x 9 1/2 inches (315 x 243 mm). Signed in the plate (not by hand). Medium: original lithograph. 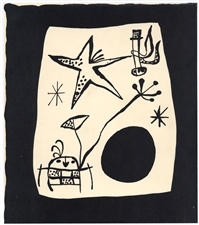 Issued in 1965 in an edition of 1200 for the rare exhibition catalogue "Miro Cartones 1959-1965", published by the Pierre Matisse Gallery and printed in Paris by Mourlot Frères. Sheet size: 12 1/4 x 17 1/8 inches (310 x 435 mm). There is a center fold, as originally issued. Not signed. Medium: original lithograph. Catalogue reference: Mourlot 672. Executed for Derrière le Miroir in 1970, and published in Paris by the incomparable Maeght atelier. 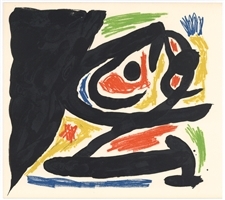 As can be expected from Maeght and Derrière, the quality of this original Miro lithograph is excellent. Sheet size: 15 x 22 inches (377 x 555 mm); with center fold and text on verso, as published. A richly inked impression. Not signed. Medium: pochoir (after the oil). 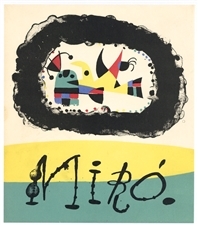 Issued in 1961 in an edition of 1200 for the rare exhibition catalogue "Miró 1959-1960", published by the Pierre Matisse Gallery. This is an exquisite, richly inked impression printed in Paris by Ateliers Daniel Jacomet. Sheet size: 12 x 9 1/4 inches (304 x 235 mm). Signed in the plate (not by hand). Medium: pochoir on sandpaper (after the oil on sandpaper). This unusual work is printed on actual sandpaper. Issued in 1967 in an edition of 1200 for the rare exhibition catalogue "Oiseau solaire, oiseau lunaire, etincelles", published by the Pierre Matisse Gallery. This is an exquisite, richly inked impression printed in Paris by Ateliers Daniel Jacomet. Size: 11 1/4 x 3 1/2 inches (288 x 90 mm). Not signed. Medium: original lithograph. Catalogue reference: M 230a. Executed in 1956, printed by Mourlot and published in Paris by Maeght as the front cover of the Jacques Prevert catalogue. The sheet size is 9 x 7 3/4 inches (228 x 198 mm). Signed in the stone; not hand-signed. Condition: as this was the actual cover, there is some wear and soiling. Joan Miro original lithograph "Les Coccinelles"
Medium: original lithograph. Catalogue reference: M 230. Executed in 1956, printed by Mourlot and published in Paris by Maeght as the back cover of the Jacques Prevert catalogue. The sheet size is 9 x 7 3/4 inches (226 x 198 mm). Not signed. Condition: as this was the actual cover, there is some wear. Medium: original lithograph. The French title translates to "A Bouquet of Dreams for Leila". Catalogue reference: M 546. Printed by Mourlot in 1964 for XXe Siecle, published in Paris by San Lazzaro. Sheet size 12 1/4 x 9 1/8 inches (310 x 230 mm). Not signed. Condition: the edges of the sheet have been trimmed a bit. Medium: original lithograph. Catalogue reference: Mourlot 302. Executed for Derriere le Miroir in 1961, and published in Paris by Maeght. Sheet size: 14 1/2 x 11 inches (370 x 277 mm). There is text on verso, as issued. Not signed. Condition: minor creasing near the left edge of the sheet and some ink spatter near the top right (apparently a printing defect). Medium: original lithograph. Executed for Derriere le Miroir (No. 125-126) in 1961, and published in Paris the same year by the highly regarded Maeght atelier. Sheet size: 15 x 11 inches (380 x 278 mm); with text on verso, as originally published. Not signed. Medium: original lithograph. Catalogue reference: Mourlot 346. 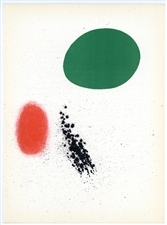 Executed for Derriere le Miroir (issue number 139-140 devoted to Miro and Artigas) in 1963, and published in Paris the same year by the highly regarded Maeght atelier. Sheet size: 14 x 3/4 x 10 1/2 inches (375 x 268mm); with text on verso, as originally published. Not signed. Whether you’re a collector, or an art dealer looking for Miro prints for your art gallery, Affordable Art 101 has the best selection of wholesale art prints online, and at the lowest prices! Please browse around and view our incredible selection of Pablo Picasso Artwork and fine prints by Henri Matisse, Marc Chagall and many others.